Set in the mystical world of the Crimson Empire, Crimson Alliance is an action-RPG game released on the XBox LIVE Arcade platform and published by Microsoft Game Studios. Choose to play as the powerful wizard, the battle-hardened mercenary, or as the mysterious assassin. Play Crimson Alliance solo or cooperatively with up to 4 players on the same console or over Xbox LIVE. 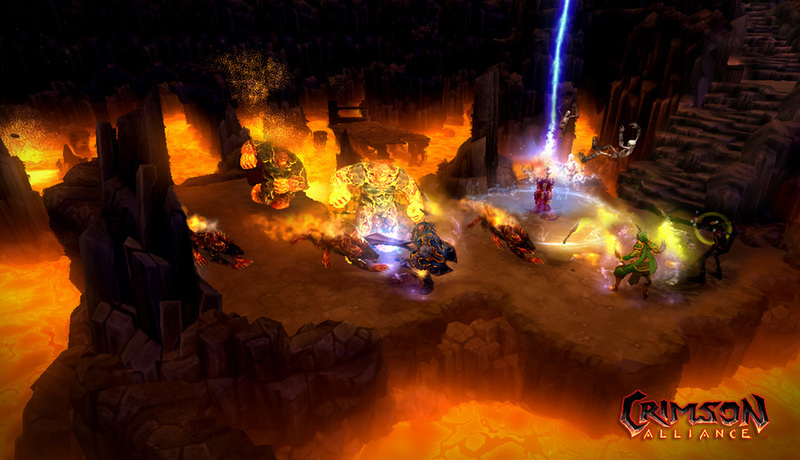 With 6-8 hours of gameplay campaign, Crimson Alliance conjures up the some of the classics of the action RPG genre, while bringing them into a newer generation of gaming consoles with gorgeous HD eye candy, connected co-op play to game with your friends, social mechanics to taunt your friends, a multitude of sweet loot to make your friends jealous, and micro-transactions to augment your character if your friends are making you jealous. Working on the design team, it was one of my many missions to grab the players' attention right out of the gates as the loading, starting, and main menu screens would be the first part of players' experience. On top of that, the characters in Crimson Alliance are strangers with different backgrounds traveling to three different, disparate locales. With so many different looks and themes colliding, it was one of my responsibilities to give the game a brand that united all of these differences. I accomplished this by creating a "Rome is Burning!" look and feel that ties in the game's narrative beginning, and is permeated throughout the elements that populate and package the game. How do you communicate to 4 different players, each potentially in a different language, while they are intently focused upon smiting enemies and do not want to be bothered with trivial information like their gold count, multiplier, inventory, and... I know there is something I am forgetting... oh yeah--HEALTH!!!? The answer is that you put the player first and design the system very carefully and thoughtfully. The player wants to know these things, but the challenge was to not interrupt their experience while they are saving the world. n addition to elegant in-game UI systems, I also needed to design the games front end UI as well as all the 4-player co-op matchmaking screens and systems to ensure a healthy multiplayer community. If you can't chart your progress through something in a meaningful way, then chances are you will quit. Therefore, another mission that I had for the game was to build a system that communicated how far, and how well, the person had progressed through the game. In addition to designing Crimson Alliance's UX and UI systems, I also wrote all tutorial copy and handled the localization process for every last word in the game. After Crimson Alliance's launch, the fans wanted more. The challenge in designing DLC was to create a unique Crimson Alliance experience without the ability to add much in terms of new game mechanics and assets due to technical restrictions. So what did we give them? LAVA and lots of it. The fans got their, "VENGEANCE," a DLC set in all new levels, one of them titled, "Inferno." My concept for Inferno provided an experience that hadn't been given to players yet in Crimson Alliance, an omnipresent environmental threat (the lava) rising all round them as the players needed to fight their way up and out of the dungeon while being slowed down all-the-way by enemies. That's hot. Lastly, our in-game microtransactions in a console game (first ever on Xbox) made it on to the radar of the good folks at Penny Arcade. The comic does poke a little fun at it, but the supporting article applauded the choice that it afforded the user: old fashioned elbow grease vs. time-saving, efficient perks.